This organic chemistry tutorial video takes you through the IUPAC rules for naming Amines. Examples include naming simple and substituted amines, along with diamines. 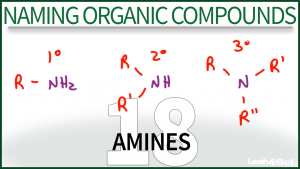 This is Video 18 in the Naming Organic Compounds Video Series. Click HERE for the entire series. I have a basic question – when numbering, if you have a functional group with highest priority but starting from there would not result in the lowest sum, what do you do? Does the highest priority matter or the lowest sum? Thanks for all you’ve done by the way – this rivals KhanAcademy and probably surpasses it. Priority becomes the ending of the name in most cases, but you don’t have to start from there unless it’s a ring. 1. I sure wish I’d found your vids the first time I was learning functional groups and naming… I have struggled with it all this time, and you made it so clear!! Thank you. 2. Your video 17 “Naming Esters” isn’t working (nothing happens when you push the play).